M. G. Leonard is an award-winning, bestselling writer of children’s books. Her Beetle Boy books have sold in thirty-seven countries and she is currently working with Nevision, writing the screenplay for a TV series based on the trilogy. She and her beetles have appeared on Blue Peter, Springwatch Unsprung, Countryfile, and the BBC documentary, The Bug Couple. Previously she worked as a digital media producer for the National Theatre, Harry Potter West End, the Royal Opera House and Shakespeare’s Globe. She spent her early career in the music industry running Setanta Records, an independent record label and managing bands, most notably The Divine Comedy. After leaving the music industry, she trained as an actor, dabbling in directing and producing as well as performing, before deciding to write her stories down. Maya lives in Brighton with her husband and two sons. Visit the Bug Farm and attend a talk all about the Beetle Collector’s Handbook, and the work that went into making it from M. G. Leonard and Carim Nahaboo. Get your beetle books signed by the author and the illustrator. Think you know the humble beetle? What about the Bombardier, who shoots acid from its bum? Or the Horned Dung Beetle, the strongest creature in the natural world? Come and discover the wonderful world of beetles with M. G. Leonard. Awesome facts and funny stories guaranteed! M.G. Leonard was afraid of beetles before she discovered how amazing they are. She is the author of the award-winning Beetle Boy series, and The Beetle Collector's Handbook (Scholastic), a non-fiction companion to the trilogy. This event is included in our Special Saturday Family Ticket bundle offer: Buy tickets for four people (must include at least one adult) for any 3 events for €30.00 from the following list: Knights and Bikes, The Beetle Show, The Legend of Kevin, Little Red Riding Hood or Dr Who? The Mountains to Sea Sci-Fi and Fantasy Quiz. Join M.G. Leonard and a host of other fantastic children’s authors at Waterstones Piccadilly for their annual Christmas Customer Evening on Thursday, 6th December. There'll be plenty of live music, mince pies and festive fun throughout the shop! For more information, visit the Waterstones website, or follow their Twitter @waterstonespicc. Come along to the 2018 WATERSTONES FINCHLEY ROAD CHRISTMAS BOOK FESTIVAL! 25th November 2018 between 11am and 5pm. Great Christmas gifts for all the family, dedicated to your loved ones and signed by the author… CHRISTMAS SOLVED! M.G. Leonard will be setting up a stall at the first Southern Invertebrate Show, taking place in Brighton on Sunday 18th November. Come along to immerse yourself in the world of Entomology, and meet livestock suppliers, specialist equipment suppliers and special interest groups. There will be animal handling and the Wild and Deadly Show for kids, so loads to see and do whilst getting your M.G. Leonard books signed! Check out the Invert Shows UK Facebook page for more information. Catch M.G. Leonard at her first Kendal Mountain Festival, where she hopes to meet budding entomologists and young outdoor enthusiasts, interested in our relationship with nature and the fascinating world of the humble but incredible beetle! So come along, all you beetle-boys and beetle-girls - come and hear about the Beetle Boy Trilogy and it’s beautifully illustrated cousin, the Beetle Collector’s Handbook. Join author M. G. Leonard and Museum scientist Max Barclay to explore the most diverse group of animals. Discover the beetles that Darkus, our Beetle Boy protagonist, finds on his search for his missing father. For anyone keen on finding out more about the wonderful world of beetles, about M.G. Leonard and her amazing new non-fiction book which crams all of her beetle-y knowledge into a beautiful hard-back compendium to the best-selling Beetles trilogy - head down to the Guildford Book Festival on Sunday 7th! Calling all Beetle Boys and Beetle Girls! - Catch M.G. Leonard at this year’s Amateur Entomologist’s Society Annual Exhibition at Kempton Park Racecourse. Want a signed Beetle Boy, Beetle Queen or Battle of the Beetles? Or how about a beautiful hard-back Beetle Collector’s Handbook? Come along to marvel at some incredible invertebrates, being shown and sold at this year’s exhibition, and meet M.G. Leonard herself! Look for STAND 26 on the Ground Floor. Tickets will be available on the gate: entry is £4 for adults and £1 for u16s. How well do you know the humble beetle? Did you know they are one of the most important creatures on the planet? Come and discover the wonderful world of beetles with M. G. Leonard, author of the bestselling Beetle Boy, Beetle Queen and Battle of the Beetles. Fun, facts and stories guaranteed! If you live in Yorkshire why not have a fun packed family day at Broughton Hall Children's Literature Festival? M. G. Leonard will be there with her trilogy of fiction and her brand spaking new non-fiction book, delighting you with stories and fun facts about beetles. The Children’s Books Ireland International Conference is a weekend-long celebration of the very best in children’s books. This annual event is a unique opportunity to critically reflect on the impact, imagination and importance of books for young people. Anyone with an interest in and a passion for children’s books is welcome to attend and participate in what is always an outward-looking, lively and thought-provoking event. CBI will feature some of the most exciting names in writing, illustration, publishing and criticism. The relaxed and friendly atmosphere provides an opportunity for librarians, teachers, booksellers, academics, artists, students, authors, illustrators, publishers and other professionals to meet old favourites and discover new voices. Dreams & Nightmares examines two essential elements of childhood: the light and the dark. Books can be a powerful and appropriate way for children to process their fears and deal with anxieties. Similarly, the power of dreaming and the potency of imagination as a force for good in the world cannot be overstated. We have invited our speakers to reflect on dreams, nightmares, the light and dark in their own work and how dreams, both good and bad, can be a driving force within children’s literature. I will be combining my storytelling skills with the wonderful live beetles from Cool Creatures to bring a unique event to the Edinburgh Book Festival this year. Celebrating the grand finale of my beetle trilogy and reading from The Battle of the Beetles with some wonderful beetles at one of my favourite festivals in all the world. You should come. It will be awesome. I will be one of the Awesome Authors at the CBBC Summer Social in August. It's a fantastic family event taking place in Croxteth Country Park in Liverpool. I'll be bringing a bevvy of beautiful beetles for you to meet on Friday August the 3rd. Tickets are on sale now, so book 'em QUICK! Catch M.G. Leonard at this year's Camp Bestival, entertaining families with her Battle of the Beetles event on Saturday 28th July. Timings TBC, watch this space! I will be taking part in the Latitude festival again this year, doing events on the school day as well as a reading in the Kids Area on the Saturday. If you are attending and your children like beetles then you should stop by. I will be appearing on the BBC1 programme, Countryfile, at 7pm on 24 June. I take Ellie Harrison on a bug hunt for beetles through a beautiful lupin meadow in West Sussex. 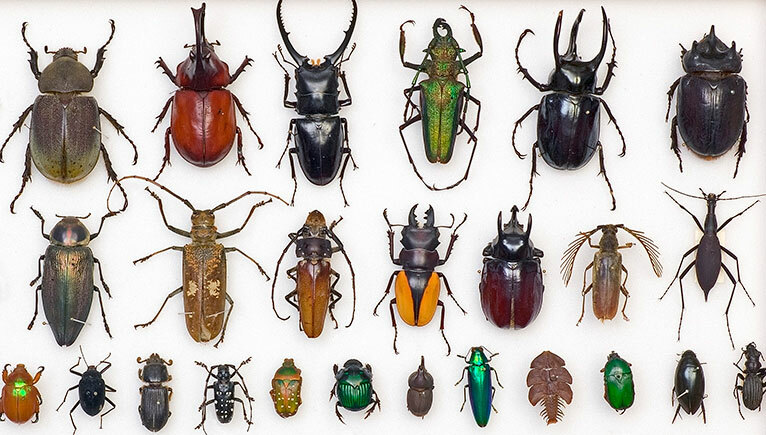 We chat about beetles and insects to celebrate National Insect Week. If you miss it on the telebox you can always catch up on the iplayer. June is the month where we celebrate National Insect Week and the wonderland of insects on this planet. This year the Royal Entomological Societ and The Story Museum in Oxford are curating a wonderful exhibition to explore the insects that inspired children's fiction featuring Lewis Carroll, Roald Dahl & ME! I'm opening the Exhibition with events on 16th & 17th of June with illustrator Carim Nahaboo. Check my events calendar for these events. They are free with the exhibition ticket entry price. YOU MUST COME! How well do you know the humble beetle? Did you know they are one of the most important creatures on the planet? That some are super strong, able to pull a thousand times their own weight? That some are able to light up the night sky and others are able to navigate using the Milky Way? Come and discover the wonderful world of beetles with M G Leonard, author of the bestselling Beetle Boy, Beetle Queen and Battle of the Beetles, in an hour of fun, facts and stories. M.G. Leonard is delighted to have been invited to speak at the amazing EntoSci '18, at Harper Adams University - an event for schools, aiming to inspire a future generation of Entomologists. After the resounding success of EntoSci16, it is returning for EntoSci18. It is the entomological conference for schools, where the delegates are the pupils themselves. Pupils will experience exciting different ‘zones’, learning all about the study of insects from the experts in the field! "Did you know that the bombardier beetle shoots boiling hot acid from its bottom? Join award-winning queen of the creepy crawlies, M. G. Leonard, for the final instalment in the Beetle Boy trilogy, Battle of the Beetles, and help Darkus and his friends stop the villainous Lucretia Cutter unleashing her hoard of giant Frankenstein beetles against humanity. Come along for this bug-tastic adventure – and have the chance to meet some real beetles after the event!" Conference will take place during the weekend of 13th-15th April at Queenswood School in Hertfordshire. Confirmed speakers include M. G. Leonard, Patrice Lawrence, Michael Morpurgo, Zeb Soanes, James Mayhew, Jackie Morris, Jacqueline Wilson, Justin Somper, Sarah Crossan, Katherine Woodfine, Robin Stevens, Kaye Umansky, Meg McLaren and Heather Crossley. The logo has been designed by Nick Sharratt. Battle of the Beetles at the Bug Farm! Battle of the Beetles, the long-awaited third book of the award-winning Beetle Boy trilogy, will undergo an informal Welsh launch at The Bug Farm. Includes a presentation from author M. G. Leonard, a talk from Dr Sarah Beynon (scientific advisor on the series), a reading and book signing. One not to miss! M.G. 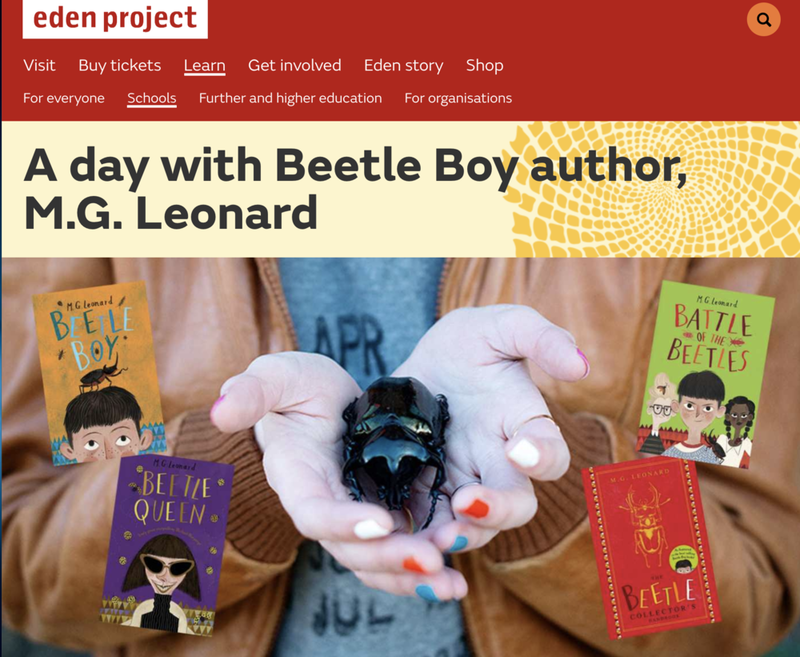 Leonard is delighted to be one of the shortlisted authors for this year's Salford Children's Book Awards, for Beetle Boy. The awards ceremony will take place at the Lowry in March with local schools invited to attend. This is the fifteenth year of the Salford Children's Book Awards, designed to introduce the joy of reading for pleasure to 11 to 14 year olds. You can follow the news and keep your fingers crossed for M.G by going to their website or following the awards on social media.